Starting Monday, August 8th through Saturday, August 13th, drop off your donations of new and unopened school supplies to Argyle Feed & Hardware. For your generous donation of a new, unused backpack, we’ll give you a coupon for $10 off your next purchase. All school supply donations benefit Mission Moms’ Blessings of the Backpacks Annual School Supply Drive. 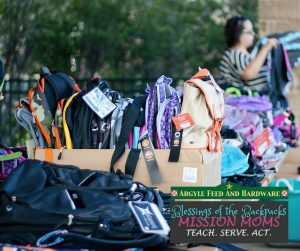 The Blessings of the Backpacks School Supply Drive helps provide backpacks to over 200 children at area schools in Argyle, Lewisville and other area school districts. Most children look forward to starting school with new backpacks, lunchboxes and supplies. However, for some families unable to provide due to financial hardship, it’s one more void that makes their children feel different. Mission Moms is thrilled to help provide backpacks and lunchboxes and give these kids yet another opportunity to feel that precious “normalcy” among their school peers. 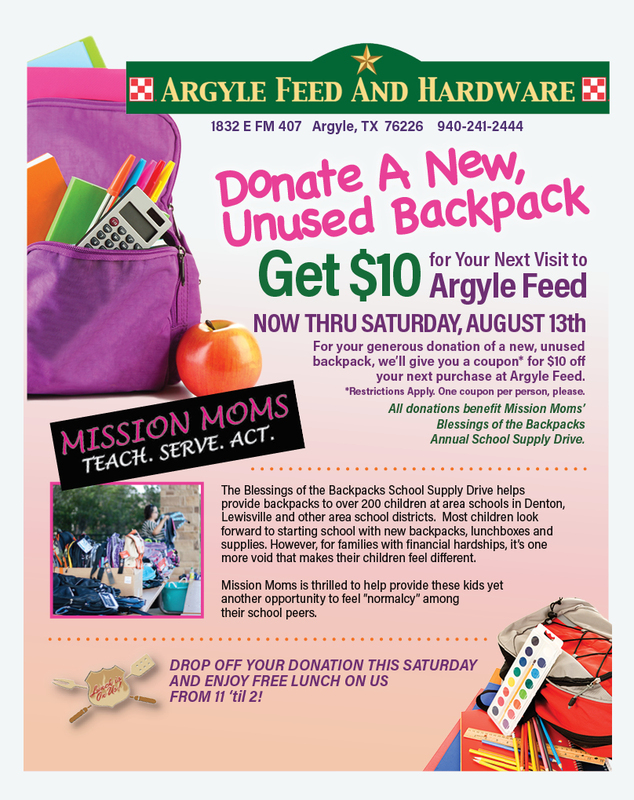 On Saturday, August 13th, while you’re out shopping for your own family’s Back to School items, pick up a few extra supplies for the Blessings of the Backpacks Drive and then head to Argyle Feed for lunch on us from 11 am to 2 pm. Of course, donations can be dropped off at the store any time between August 8th and 13th. Help kids in our community begin the school year with a successful start and we’ll reward you for your generosity with $5 off your next purchase at Argyle Feed & Hardware! This entry was posted on Thursday, August 4th, 2016 at 1:55 pm	and is filed under Events, News & Updates. You can follow any responses to this entry through the RSS 2.0 feed. Both comments and pings are currently closed.